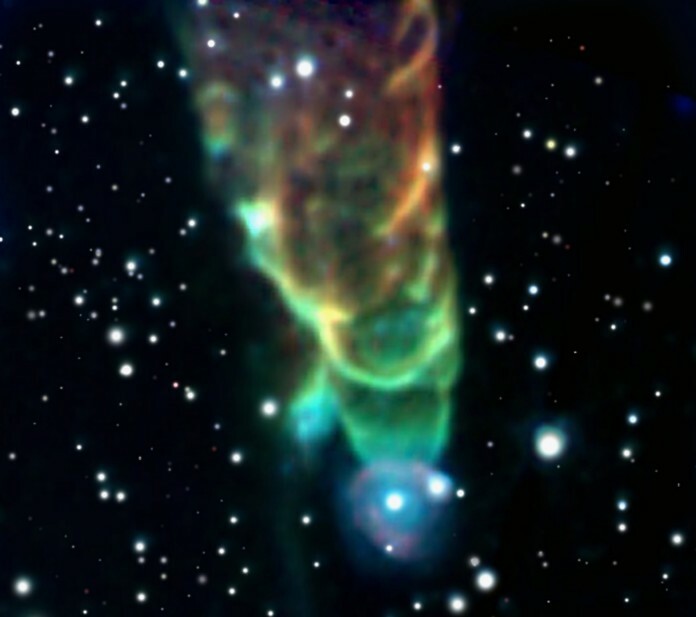 Explanation: Light-years in length, this cosmic tornado is actually a powerful jet cataloged as HH (Herbig-Haro) 49/50 blasting down from the top of a Spitzer Space Telescope view. Though such energetic outflows are well known to be associated with the formation of young stars, the exact cause of the spiraling structures apparent in this case is still mysterious. The embryonic star responsible for the 100-kilometer per second jet is located just off the top of the picture, while the bright star seen near the tip of the jet may just by chance lie along the line of sight. In the false-color infrared image, the tornado glows with infrared light generated as the outflow heats surrounding dust clouds. The color coding shows a trend from red to blue hues at the tornado's tip indicating a systematic increase in emission at shorter wavelengths. The trend is thought to indicate an increase in molecular excitation closer to where the head of the jet is impacting interstellar gas. HH49/50 is about 450 light-years distant, located in the Chamaeleon I molecular cloud.